The party bus Sarasota service that we offer helps people to have a good time while seeing the town. Sarasota Florida has several attractions to offer to visitors. For those who are traveling to the area in groups, or need to transport teams of corporate people, party bus rental service will suit their requirements. Speak to our live customer service agents at 813-514-6980. 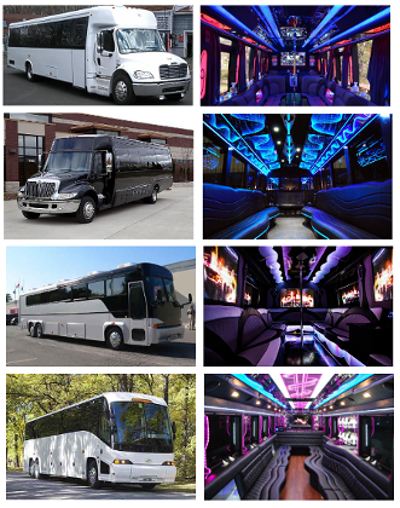 The party buses that we offer come with luxury amenities. There is kitchenette and night club settings, which can help transform any ordinary coach into a night club on the move. For celebrating special occasions like a corporate event, bachelorette, a birthday party or an anniversary with friends and loved ones, there are 20 passenger party buses to choose from. You can also book with reliability as the party bus rental service is highly reviewed and depended upon in this region. The party bus Sarasota service that we offer can be easily booked online. The website has 30 passenger party buses and more which can be chosen from. From double decker models for compact limousine coaches, one will surely love the amenities and luxury features that are offered. The party bus rental service is easily booked when you have chosen the limo bus model you wish to hire. One can check the rates and agree to the terms of hire before making the payment and finalizing the booking. One can also opt for special discounts and offers that are made on the site from time to time. Call now for updated prices and availability 813-514-6980! Mote Marine Lab; an aquarium in this area with a vast collection of underwater creatures. John and Mable Ringling Art Museum; modern works of art worth checking out. Siesta Beach; a place for beach activities all day. Marie Selby Botanical Gardens; a green stretch along the bay area. Ed Smith Stadium; exciting baseball games can be checked out here on weekends. This is a place to catch the above exciting landmarks and much more around town. The shuttle service to and from the nearby Sarasota Bradenton International airport is required for tour operators. They often need to transport groups of people to and from the airport in time. With the party bus Sarasota service, this is easily arranged for. The party bus service can be availed of when traveling a long distance. There are 50 passenger party buses for hire which one can check out and book for groups traveling long distance to nearby towns or cities like Bradenton, North Port, Gulf Gate Estates, Sarasota Springs, Palmetto, Englewood, Bayshore Gardens, Gulfport, South Venice, and Saint Pete Beach.